"Guanxi" (pronounced (jwan-see) is one of the most powerful forces in Chinese culture. Though the direct translation of "guanxi" is "relationships", the concept as it is used and applied in Chinese culture is much richer and encompassing. 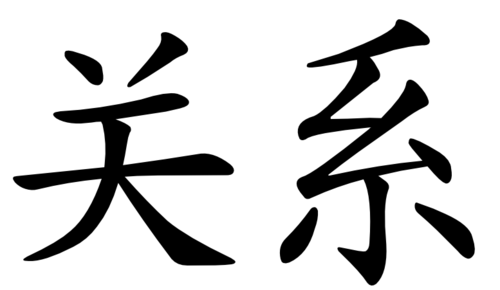 "Guanxi" does express the relationship of one person to another, or one party to another. However, more importantly the term also expresses an obligation of one party to another, built over time by the reciprocation of social exchanges and favours. If one has "guanxi" with another, one will be quick to do a favour, act on another’s behalf and depending on the depth of the relationship, do anything necessary for the other party. By establishing this type of relationship with someone, the other party is implicitly agreeing also to be available to reciprocate when the need arises. In such a way "guanxi" can be considered as a type of currency that can be saved and spent between the two parties. Like money, it is a resource that can also be also be exhausted, so one must be sensitive not to overextend the "guanxi" that has been established. The exchange of favours does not have to be in like kind. So if one person helps introduce you to someone, it is not beyond the scope of the relationship for that party to then ask you to help get a visa to your country, or get their son into a foreign school. Failure to repay favours in this type of relationship is equivalent to not paying a financial obligation. If one cannot accommodate a specific request, one must find another way to make amends, perhaps by sending along a small gift to let the party know you are sorry you could not help and that you still want to maintain the relationship. The reciprocal nature of "guanxi" and its implied obligations is the main reason why Chinese are reticent to engage in deeper relationships with people they do not know. To begin such a relationship may put you in a compromising position from which it is difficult to withdraw. Additionally, to establish "guanxi" with someone who later proves unworthy will also tarnish that party’s reputation, so the Chinese would rather not begin a relationship with someone they do not know. Finally, in establishing "guanxi", that person or party may want to know up front what they hope to gain from the relationship, to insure they are not contributing effort or services without gaining something in return. Given this background, if you would like to begin a relationship with a Chinese individual, group, or company, it is most expedient to be introduced by a mutual party who can vouch for you. But note that the intermediary is also expending "guanxi" to make the introduction so you will need to repay the favour. Gifts are often used in "guanxi" to establish, or bring equilibrium to the relationship. If one is feeling too indebted to another, that person may bring a gift to bring the relationship back into balance. Also, if one feels that they have offended a party, or if they would like to increase the strength of the relationship to then ask a favour, they may give a gift. If you receive a gift from another, you do not necessarily have to return a gift, especially at that time. Try to determine the reason for the gift so that the problem is not further exacerbated. If you just brought a new customer to a business, the gift will be in response to favour. If someone had to back out of a deal, the gift will be an appeasement. However, if someone is trying to curry favour and you do not want to be engaged, quickly return a similar gift and you are released from that obligation. Not all gifts have elaborate motives behind them; often people are simply expressing gratitude for your presence or friendship. Doing business in China? Why not take part in a tailored 2-hr webinar to help you navigate the local commercial culture?